Muddy water can be one of the most daunting challenges for bass anglers. The only thing worse is cold muddy water. In this article we’ll go over the tactics to help you catch bass when the water is dirty. Bass of any type including Largemouth, Smallmouth, Spotted, etc. are all primarily sight feeders. So is there anything that will help them detect prey in very low visibility water? Yes. Bass and many other fish have lateral lines. Lateral lines help bass detect prey in the water. They’re basically tiny hair cells that can detect movement, vibration and changes in pressure. So with this in mind, we can set up our lures to attract bass in muddy water by helping them find your lure. When it comes to lure colors for muddy water, it’s actually really simple. You’ll want to start off with dark colors. Black and blues are great. These darker colors stand out more against muddy water. Dark colors help create a better silhouette for a bass to home in on. Bass probably won’t be able to see your lure at first. However, as the bass gets closer, bass will be able to see it stand out more clearly. Black and blue jigs with soft plastic trailers that are bulky are a good choice. Crayfish imitating soft plastic trailers can be a good lure. Put one on the back of a jig. If the water is just a little muddy, you can try a bright yellow or chartreuse. Fire tiger is a good choice for somewhat muddy water. So, if black and blues are not working, consider gold or chartreuse colors. Try a spinnerbait or a crankbait in these colors. Another great tactic for muddy water is flash. Spinnerbaits are great at adding flash to your presentation. The spinning blades will give the impression of a baitfish darting. Gold blades are a great color to try in muddy water. Try a spinnerbait with a gold willow leaf pattern. Chartreuse and white blades can also be effective. For the the ultimate flash, try an Alabama rig. Set it up with multiple spinning blades. This added flash will make it much easier for bass to find your lure. Remember to check your local regulations. Some locales have banned multiple hooks on an Alabama rig. 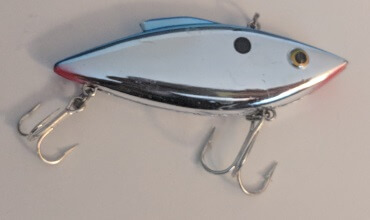 Another option for adding flash is a gold or chrome crankbait. A gold crankbait with a nice rattling sound can be deadly in muddy water. This is especially true around current. Pull your bait past a break in the current. Chances are, a bass will be lying in wait to ambush it. A noisy lipless crankbait can be a great lure for bass in muddy conditions. Rattling lures are hugely popular in muddy water scenarios. Bass can definitely hear very well. Combined with their lateral line, bass are able to detect sounds and vibration from a distance. So, pick up some rattling crankbaits. Or add rattles to lures that don’t come with them. Here are some ideas. Lipless crankbaits like the Rat-L trap are an old favorite for muddy water. Retrieved quickly over grassy or woody cover, they make a bunch of noise that can really attract strikes. Regular diving crankbaits with built in rattles are also a good choice. But what if you’re fishing post frontal conditions? Or in cold water and the bass aren’t going for fast cranking type lures? Well, the good old jig with a trailer can come to the rescue. Now normally, these are mostly silent lures. You can get them to make some noise by banging the jig head against rocks. But you may want to add some extra noise. Get yourself some jig rattles. You can attach these to a jig and it can really make a difference. Another tactic for adding noise soft plastic lures is adding a bullet sinker and a glass bead. This works by threading a bullet weight on to your line, then a glass bead. Finally, you tie on your hook. You can then thread a plastic worm on the hook and start fishing. As you raise and lower the worm, the bullet sinker will slide down on the glass bead and make noise. Shaking your rod tip can increase the frequency of this sound for added attraction. If you don’t want the bullet weight to slide too far up the line, you can add a bobber stop. A bobber stop will stop the weight at the point on the line of your choice. So now you know what kinds of baits and accessories you can use to help you catch bass in muddy water. But, what should you look for? If you’re dealing with cold water, keep in mind that muddy water will get warmer faster than clear water. This can be an advantage. This difference can be very small. Perhaps just half a degree. But it can be enough to attract bass. So, if you see an area where clearer water and muddy water converge, make sure to try both sides. If you’re fishing a reservoir that has many feeder creeks you may want to keep tabs on when rain goes through. Shortly after heavy rains, those feeder creeks may pump lots of muddy water into the lake. If you can move away towards the main channel, you may find areas where water is significantly clearer. As the days pass. The muddy water will move out towards the main lake. You can then move back into the feeder creeks in you’re looking for shallow or spawning bass. If you can’t get away from the mud. Keep in mind that bass may be holding close to heavy cover. Look for logs and brush piles. In these scenarios, flipping jigs with rattles and plastic trailers can be a good tactic. Also, if you have sonar with side imaging, this can really help you find schools of baitfish. And once you find them, the bass can’t be far behind. Muddy water can be intimidating, but if you follow these tactics, you should still be able to land a lunker.